That is amazing. I simply must get to the Castle and brewery at some point. Interestingly enough in the early 90's it was one of the Traq brewers that lead me down the path to the boil down method as a possibility. They were also the reason that I bought some oak casks. Traquair House Ale really is a wonderful drink. Nice, Phil. A few random thoughts: Were you wearing your kilt? Why did they give you a ladies pint? She's kinda looks like Cameron Diaz' mom. Just to play devil's advocate, I would think vanillin would enhance caramel flavors. I thought Traquair used old barrels wouldn't yield much of much into the beer anyway. But yeah, a fresh barrel would also leech trehalose and other bits in that might enhance it. Had another thought. An old barrel will allow for micro-oxygenation as well, maybe then some oxidative characters, but then I would expect TH to also have some acetic character. Without boiling down the first runnings, does anybody know how long the wort would need to be boiled to get the same effect? My guess would probably be at least four hours. First of all, thanks very much to skotrat for the suggested recipe. I am currently brewing this, actually as I'm a big fan of Traquair House Ale. In my opinion it is the benchmark for the style. It seems that many brewers are complicating the style when it possibly doesn't need to be. 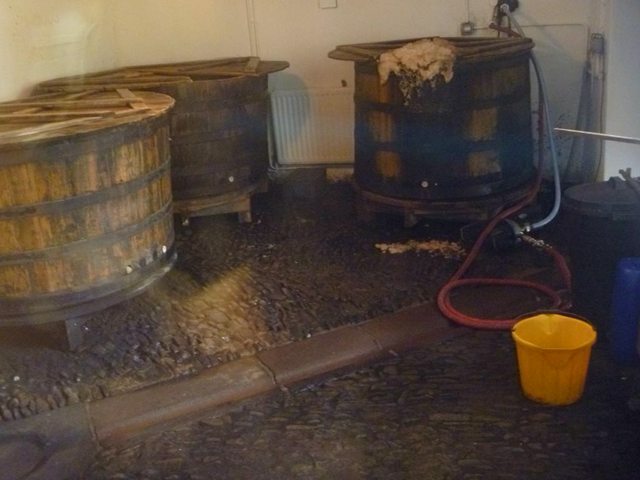 The original oak fermenters are around three hundred years old, and are very small. I would argue that these undoubtedly have an effect on the final flavour as they do not appear to be lined. This could be tricky to replicate! The boil is around two hours. Hops are East Kent Goldings and appear to be added at the start of the boil, and ten minutes before flame-out. The yeast is Nottingham. Not Edinburgh! Strike water is 165f or 74c. Fermentation starts at 65f (18c) and not allowed to exceed 70f (21c) as the fermentation takes off. Starting gravity 1072, terminating at 1018. I strongly recommend anyone visiting Scotland to go to the historic Traquair House. It's a great day out, and not far from Edinburgh. Here's a photo of the brewery. Note the krausen! Thanks for the information Rodabod. Yeah, that is an awesome picture.